Battersea Park Dog Show returns on Sunday 24 June 2018 for a fun filled day of competitive canine classes and activities in support of Armed Forces Day. Enter your dog into a variety of pedigree and novelty classes such as best sporting dog, best rescue dog, best trick, and best marching dog, supported by the Special Armed Forces. 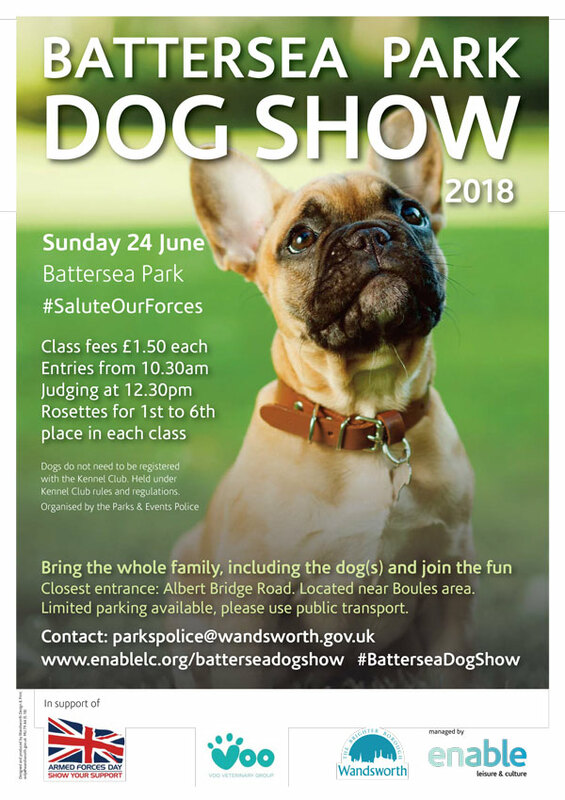 Wandsworth Council’s Battersea Park Dog Show has teamed up with the Armed Forces to celebrate Armed Forces Day; a national event to promote the global work that the Armed Forces carries out; promoting peace, delivering aid, tackling drug smugglers, providing security and fighting terrorism. Entry to the show is free, and for those competitive canines, class fees are £1.50 per dog. Entries will be taken on the day from 10.30am with judging starting at 12.30pm. The winner and five runners up in each class will receive rosettes. Battersea Park Dog Show is proudly sponsored by Voo Vets Group (VVG). VVG are a family run group who are friendly, caring and approachable. They offer an integrated approach to veterinary medicine; general, specialist, hospital and 24hr emergency care. Free second opinions, free health-checks, affordable healthcare plans, free advice and support in choosing a pet to join your family, 25% off your pet’s first treatment and lots more. VVG love looking after the local pet community and take a great deal of pride in being able to make a difference to you and your pets. Pop in to meet their team on site at BPDG, they would love to see you! The event is delivered by Wandsworth Parks and Events Police Service, in support of Armed Forces Day on behalf of Wandsworth Council. The Parks and Events Police are responsible for the routine patrolling of the parks, commons and open spaces within Wandsworth; the enforcement of byelaws, Dog Control Orders and other park regulations; and the policing of events. All funds raised will be donated to the Friends of Battersea Park. All dogs must be kept on a lead and you must clean up after your dog. The judge’s decision is final. Dogs are entered at owner’s risk. Dogs do not need to be registered with the Kennel Club. Held under Kennel Club rules and regulations. Battersea Park (near Boules area) SW11 4NJ. The Friends of Battersea Park is a registered charity formed in 1988 to help maintain and improve the Park as an oasis of tranquillity, natural beauty and recreation.